Beautiful Aeolian pastel coloured houses, solid infrastructure, picturesque streets, great hotels and restaurants all account for Lipari being considered the “capital”. The citadel lords over Marina Lunga and Marina Corta where boats to and from the mainland and other islands dock. 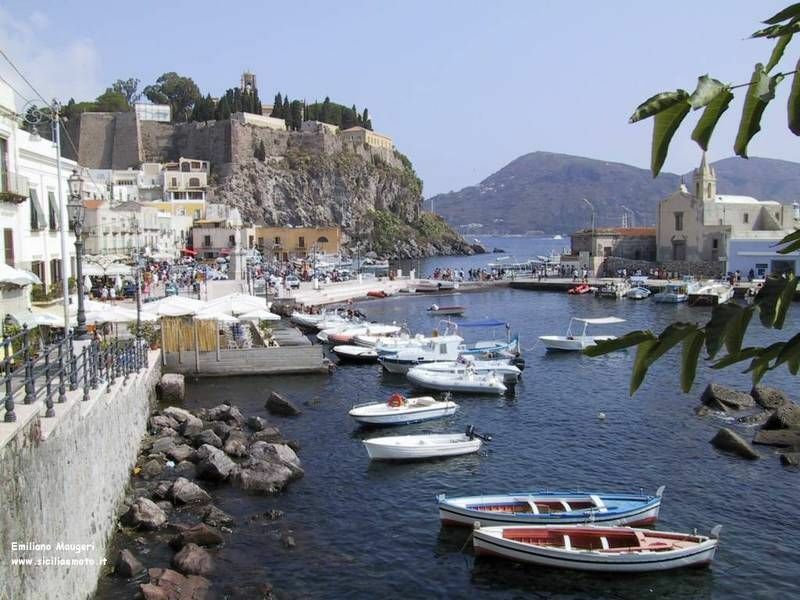 Its castle sheltered Lipari from raids by pirates after the obsidian and pumice, rich trades. After the bloody raid by Barbarossa in the mid 1500s, the Spanish rebuilt it. As you enter the castle from Via del Concordato you find the Cattedrale di San Bartolomeo constructed where formerly there was a Norman church destroyed by Barbarossa. Only its Benedictine cloister remained standing. Décor includes chandeliers and the saint’s 18th century statue. The cathedral is surrounded by run-down churches. The Neolithic and Roman artefacts unearthed south of the citadel comprise the Museo Archeologico Eoliano’s collection, one of the most complete on the continent. The Palazzo Vescovile displays pieces from the Neolithic and Bronze Ages and from Roman times. A little annex exhibits prehistoric artefacts from the other islands. The classical section has 11th century BC pieces from the necropolis such as burial urns and models of burial sites. On the first floor are stunning decorative vases, a wide collection of Greek masks, jewellery, statuettes and polychromatic 3rd century BC vases. The Epigraphic Section is separate with a room of Greek and Roman tombs and a garden with engraved stones. The Parco Archeologico Contrada Diana, on the west side of Via Vittorio Emanuele, contains sections of the 4th and 5th century Greek walls, vestiges of Roman houses and the necropolis’ tombstones. Outside Lipari town are some good bathing beaches. The tranquil village Canneto, lying to its north, boasts a pebble swimming beach. Spiaggia Bianca is a popular beach of pumice sand. Porticello’s pebble beach is also recommended. The top bathing beach is the tranquil di Vinci only accessible across fields of high grass, flowers and cacti. You can also hire a boat to take and collect you. The sea is perfect for snorkelling and diving and courses are offered at La Gorgonian Diving Centre which also hires out equipment. The different diving spots range from medium to difficult with depths up to 45m. In Punta Castagna, Secca del Bagno and other spots you will experience a rainbow of colours, see shoals and shoals of tropical fish and octopi. To the south of Lipari town is the observatory scanning Mediterranean seismic action. Campobianco’s working pumice quarries sit near Spiaggia Bianca and Porticello. 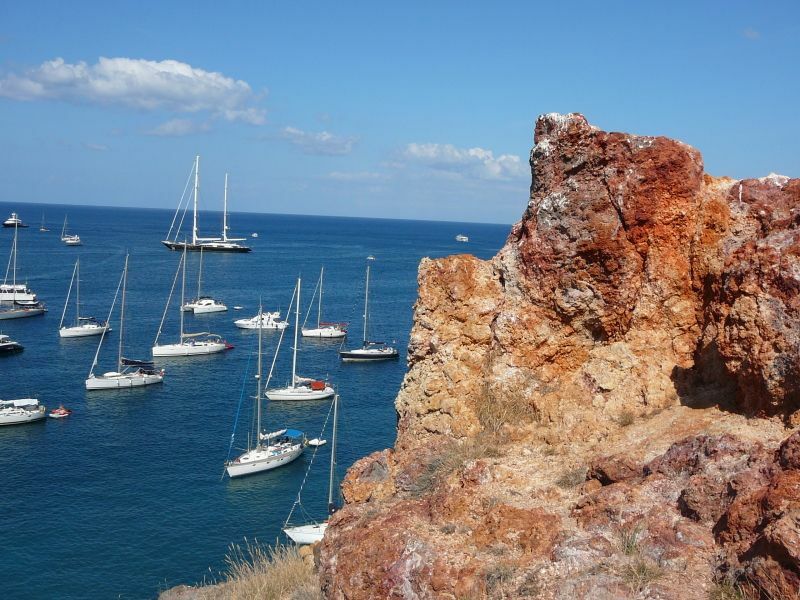 After a boat trip you can have fun sliding down the pumice slopes to the sea. A bus runs up to Quattrocchi, the view point from where you can view Vulcano, a neighbouring island. Some kilometres away a lane leads to San Calogero whose thermal baths used to reach 60º in the Roman times. If you wish to take home souvenirs or specialities, jewellers selling coral and delicatessens offering malvasia wines, sweets, anis biscuits and capers abound. The tourist office on Via Vittorio Emanuele gives information about the whole archipelago and the free of charge hostel, Ospitalità in Blu. La Piazzetta near Via Vittorio Emanuele serves great pizza in magnificent surroundings. La Cambussa on Via Garibaldi focuses on fish with some lovely pasta additions. Le Macine in Pianoconte, praised by the Slow Food organization, serves dishes with imaginative touches. Kasbah on Via Maurolico serves great dishes in a North African atmosphere. Savour its magnificent pizza and its linguine with dried pressed fish roe. 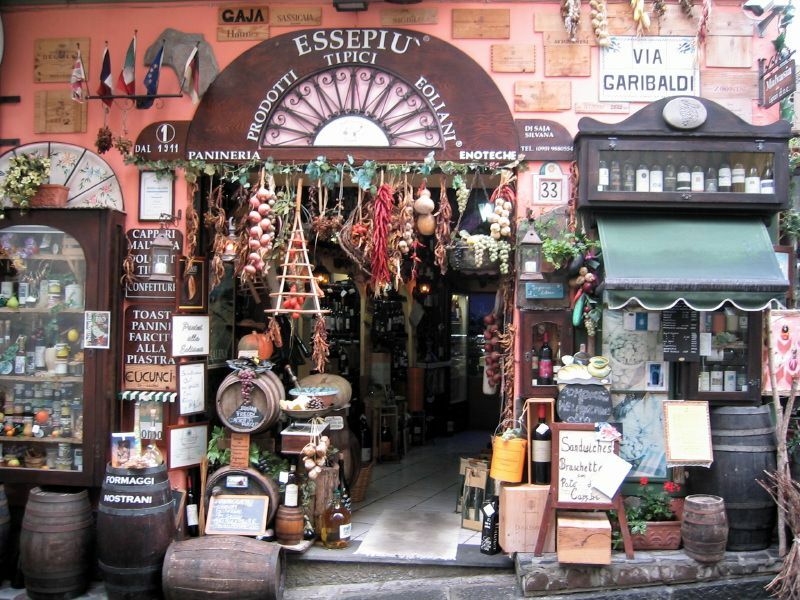 Filippino on Piazza Municipio is a fashionable place with a typical Sicilian menu. If you have a sweet tooth try Pasticceria Subba (Via Vittorio Emanuele). For a bit of nightlife, on Marina Corta there are the bars Il Gabbiano and al Pescatore or La Precchia (Via Vittorio Emanuele) to enjoy live music. BY FERRY OR HYDROFOIL: ticket offices are at Marina Lunga or Marina Corta. BY BUS: frequent buses serving the island (Canneto, Acquacalda, Porticello, Quattrocchi and others) leave from near a filling station on Marina Lunga. In the summer there are more services and you can purchase a booklet of tickets.